Looking at the armies of animators, riggers, character modellers, etc., in the credits of a major animated film, it’s evident that there’s a lot of work going into it. Consider also the graphic novel medium, which has taken off incredibly since The Dark Knight Returns by Frank Miller, Klaus Janson and Lynn Varley flipped a switch in the 1980s. There are high-production-value books, like Dark Knight, Jeff Smith’s Bone (which is accurately labeled an epic, but which can technically be combined into one paperback), and more recently the Amulet series by Kazu Kibuishi, all of which encompass untold gruelling hours of writing, designing, drawing and redrawing, and colouring. (Bone, now available in colour, was originally in black and white but with virtuosic pencilling and inking). Telling a story in beautiful pictures takes sweat and tears, or time, headaches, and repetitive strain injury. Some of the most effective cartoon art I’ve experienced belongs to Allie Brosh’s Hyperbole and a Half. Simple, childlike drawings don’t hurt Captain Underpants’ popularity, or Wimpy Kid’s, although the attraction is different. I’m not putting down Dog Man as a work, but I don’t think it takes as long to draw as Amulet. So high production values are not indispensable for compelling storytelling. Is there something satisfying I can produce for my own amusement with free tools and limited time? The way to find out is to simplify down to bare bones. Going back to those credits lists, the sky is obviously the limit as to how much work can be put into an animation. To experience a little of what it’s like to animate a character, I tried really hard to simplify. I’m not good at that. I used Blender, because it’s extremely capable, but also because I have some familiarity with its interface. Blender’s dangerous, of course, because you can get fancy. 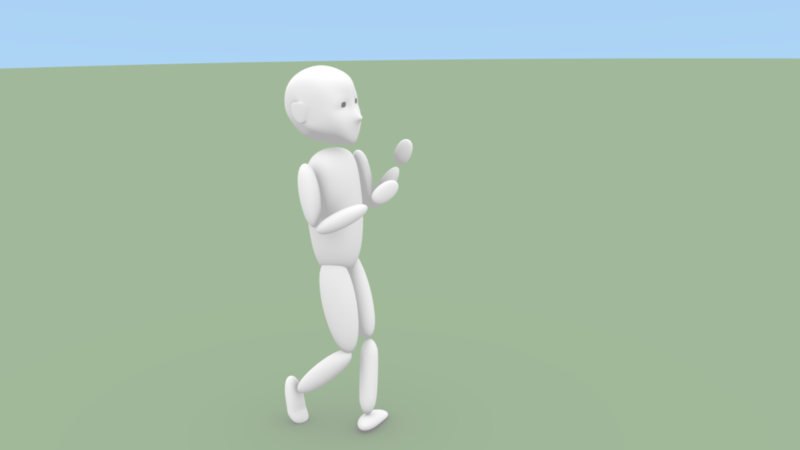 I started with a character with disconnected body parts, no fingers, no facial expressions, no hair, and no clothes. The background is ground and sky. The aim was just to copy the motion in a short clip of my older kid goofing around in the early falling snow. I didn’t add the snow! Figuring out which parts to pose first to get the best motion was hard; I started with the feet in this case because their whimsical movements led everything else and it was all irregular. Seven seconds of this was biting off a bit more than I could comfortably chew! 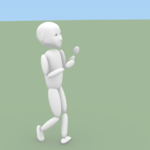 Maybe I should have started with a walk cycle. The learning curve here was steep and many hours went into the posing (over a few months), with several redos. 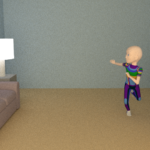 After keyframing a lot of poses, I did some cleaning up in the F-curve editor, but left it fairly rough. There’s plenty I can see to fix, especially the timing of the jump relative to the push-off from the foot. And that moment where the feet collide, due to my messing with the motion curves after keyframing. Nevermind. Time to move on to the next exercise! I wrote more about the technical details within Blender here. I’m always fascinated by animated movies these days. Even in films with major shortcomings and/or clear budget limitations, at the very least there’s usually some amazing craft shining through in the character animation, textures, rigging, lighting, props modelling, etc. You know the people who create this magic are not the highest-paid in the corporation, but they put a lot of the brilliance into the product. Despite being turned off by the trailers for Despicable Me, when I saw it (this happened despite my prejudice, because I have children) I felt real glee from the character design, cartoon animation and materials (the writing and performances as well). From Paris-based Mac Guff/Illumination Mac Guff, also responsible for Minions, Secret Life of Pets, Sing. Another film I wouldn’t have thought I’d appreciate was Trolls (Dreamworks) — which I saw in the theatre (with an anticipatory headache) with our younger child, while the elder saw Moana with Papa. I was definitely doing Papa a favour, but on a large-ish TV rather than a big screen, it’s a lot easier to take. On re-watching, I’ve noticed lots of details that I just couldn’t see with it all up in my eyes and ears the first time. Of course the music and gags keep the kids coming back to it at least as much as the 100% all-the-time saturated colours, but it’s beautifully animated and performed. Thunder and the House of Magic is a sweet, if fairly straightforward, movie with lovingly-made visual details and mood. The kids have watched it two or three times on Netflix. Which isn’t saying that much, because kids will watch some really awful garbage, but this one’s not garbage. From nWave Pictures, based (at least originally) in Belgium. Rio and Rio 2: Less flair than some, but the animal and plant-centred visuals are clearly a work of passion and the kids enjoy it. Blue Sky Studios, an American studio with a long and interesting history in CG effects. As I expected, Moana was pretty good, as Disney has recovered to a large extent from its pre-Pixar cynicism and mediocrity, and it’s always fun to see how their technology moves on between films. Most recently, I took the kids to see Ballerina, animated by l’Atelier Animation, a Montreal…animation studio…founded in 2012. The animation is again wonderful while the plot is predictable. There’s a feeling of lost opportunity, as though the story could have been worked up into something better with more time and resources. There’s at least a bit of a lesson in working hard for an accomplishment, although it’s unfortunate that the hard work is so magically fast-acting. Some people involved in this movie obviously really love ballet and some people (this set likely overlapping the other) really love animation. There were zero boys in the theatre the day we went. Related: we rewatched the Shaun the Sheep Movie (from UK-based Aardman Animations) a few days ago. So brilliant. A different kind of genius, real and solid in its Plasticine way. So much work, accomplished by so few people – compare the credits to the endless list at the end of a Disney film! The Britishness of the minute details is wonderful and as an ex-pat (I’ll always be an ex-pat of somewhere now) I savour them with Melancholic Nostalgia (available for purchase in Canadian grocery stores, next to the Nando’s Piri Piri sauce and two aisles over from the McVitie’s and the Nairn’s). Not much related, but sort of: why did Costa Coffee enter the Canadian market in Shell Stations? Surely this is not a good association. Since Tim Horton’s stopped making doughnuts in-store while I was gone (which was a big deal, and allegedly even made doughnuts more expensive to franchisees) and are owned by a multinational, I don’t think it would be a loss if few of them turned into Costa Coffees. I had been wondering why Tim’s doughnuts seemed to have lost their magic. I thought it was just me getting jaded with age, but this time it was really just that they’re crappy now so the parent company can make more money. Way off on a tangent, I had a tab for Aardman and a tab for Wagamama open next to each other in Firefox and their favicons are almost the same thing. I splurged on a mechanical “gaming” keyboard for our family desktop computer: a Logitech G610 with Cherry MX Red switches. Its predecessor, a Cherry low-profile membrane keyboard, had lasted years, but some keys were becoming unreliable due to mysterious crunchiness beneath. I have removed keycaps in the past for cleaning, but replacing them properly on the scissors-style plastic clips is a questionable proposition. I don’t game. The kids play some web games and Minecraft. I’m reasonably nostalgic for old-fashioned mechanical keyboards (which I used as a matter of course in the old days when that was what a keyboard was), although I’ve typed high volumes on various lower-profile keyboards and they can be fine as far as I’m concerned. I’ve had two Cherry-branded keyboards, neither of which had Cherry MX switches. What I would call a poor keyboard would be something really budget-constrained like that on Asus’ original eeePC (2007?) or Acer’s Aspire Switch (2014) (which was the last thing I found time to blog about, and whose keyboard was not very responsive from the beginning, but which at least never really deteriorated despite a couple of coding-intensive years, unlike my wrists!). The computer attached to the G610 is a Linux box, so no Logitech software is available to program it. Keycaps are removable. If something gets under there, I can pull the key and clean it out. There are fairly large gaps for things like crumbs to fit through, though. Nominally, there should be no crumbs near my computer but it does not seem to be the empirical case. I like the white backlighting. I find the minimum brightness nice night and day (and I don’t generally have the lights off). But, because the backlight LED is at the top of each key, the alternate character (accessed with SHIFT) is printed on the lower half of the keycap instead of the top. If the LED has to be up there for functional reasons (does it?) I would have preferred the alternative solution of setting the two characters side-by-side. The Caps Lock, Num Lock, and Scroll Lock indicators are not dimmable, so when the keys are dimmed (or unlit), the indicator LEDs are irritatingly bright. I have an idea of putting polyimide tape over for a warm amber glow, but that’s not exactly elegant. These should really just follow the brightness chosen by the user for all the other lights. The LEDs default to a slow wave rolling across the keyboard on boot. Idling, that’s cute. I don’t know who would find it tolerable during use. Without Logitech’s software, on each reboot I have to hit the brightness key + 0 to get it to settle down to a constant backlight — and then set the brightness. The caps lock indicator LED can get confused and indicate the wrong state. This has been mentioned in reviews of the keyboard. One reviewer said removing the Logitech software had solved the problem. I never had the Logitech software installed as I’m on Linux. Possibly related: sometimes it behaves as if the shift key is permanently held down – mouse functions are changed, keypresses are shifted. It may be more complicated than that. The key itself doesn’t get stuck. Twice, I have solved the problem by literally mashing my hands around on the keys for awhile. Does this indicate the issue may be an intentional mode with a key combination to toggle it? Dunno, but I don’t have a use for it. The Cherry Red switches have some lateral wobble which is unsettling at the moment. Don’t know if it’s good or bad for typinng in the long run. Actuation force is so small that it bothers me a bit. The Red switches don’t give a tactile clue as to how far is far enough to activate a key. It’s generally not very far. As a result, I’m finding it very easy to inadvertently push the space bar or “a” (on which apparently I sometimes lightly rest a finger on) as it can register with very little movement.aaaaaaaaaaaaaaaaaaa Maybe the Brown switches, with the “bump” sensation, would mitigate my issues. I haven’t tried them. There’s quite a lot of noise even without clicky switches, particularly the rattle of the space bar, but all the keys make noise when they move laterally, when they bottom out, and when they top out on rebound. After three months, I find I’m still sloppy with the tall keys, hitting extra ones on the way to the one I’m aiming for. I suspect I may have done this with other mechanical keyboards in the distant past, but that the keys were less likely to register a light brush than these are. No one else in the family likes this keyboard. They’d all prefer chiclets and find the tall mechanical keys aggravating. I really want to like this keyboard, and I kind of do, even though it’s not really logical given that I make more errors using it than I did with my previous one. White backlighting, removable keycaps, dedicated media keys (scoff away), volume roller… all good things for me. But when I finally give in and order an ISO-layout keyboard, it’s not going to be another Logitech G610.